On August 22nd 2013, Dengeki Online published an interview with Kokubo Hikaru, at the time the reigning Japanese national champion and the first Pale Moon cardfighter to ever hold the title. The interview was conducted as part of comprehensive coverage of Bushiroad's events, and was done alongside other interviews with the winners from the Weiss Schwarz, Chaos and Victory Spark tournaments. As the state of the English card game is now firmly in the BT12-on format Kokubo became champion in, his strategies are increasingly relevant for international cardfighters. Below is a translation of his interview, held on the 11th of that year following the national championships. Kokubo v. Uemura Shouhei, FR2013 finals. Image source. What was the reason for your victory? "During the Swiss rounds I had an opponent who lost because of a problem with riding and I won because of that, but I wonder if that momentary opportunity was a good thing or not." What is your most used card? "I think it's "Purple Trapezist." I'm grateful to have this PR card around." The WGP (World Grand Prix) is already beginning, but how would you challenge it? "Without changing anything for the future, I would do it using the Pale Moon that I love. This clan is really strong!" The "riding problem" that Kokubo identified is the everpresent fear of what has been called gradelock or misriding in the English game, where a cardfighter is unable to reach grade 1, 2 or 3 at the right moment and spends a turn or more behind the opponent. Winning by way the opponent being gradelocked has been a source of conflict around the world, as many fighters both professional and otherwise consider gradelock the game's worst aspect because of how it prevents one from putting up an effective fight, and thus the wins are felt to be illegitimate both by the defeated and the victorious. Particularly in BT10-on formats where grade 1 and 2 10000 and 12000 power attackers are prevalent, gradelock can spell a rapid death sentence with no opportunity to catch up. The deck that never becomes gradelocked has become a holy grail for professional play. However, it should be noted that Kokubo was referring to the Swiss elimination rounds used to determine the top 2 fighters, not the actual game that decided the Japanese national championship. Kokubo is well known for his Luquier “Я” deck and accompanying strategies, as his major victory with the build came on the heels of the second Tachikawa Vanguard Championship results just days earlier. At the time this confirmed Luquier “Я” for the larger community as one of the best decks of the format, and also brooked a major division in play style. Kokubo Hikaru's Luquier deck was played with four of each Dragon Tamer for crossride consistency, but there was also a strong camp in favor of playing Luquier “Я” with Miracle Pop Eva for a game-changing endgame assault with four to five attacks in the turn that any deck would be hard pressed to survive. Kokubo's decision to focus on his crossride was partially based in the importance of the Dragonic Descendant matchup in Japanese play at the time, which defined the viability of many decks; the difference between base 11000 and 13000 defense was the difference in whether an unboosted Descendant could be guarded for two triggers to pass, or no pass with a single 10000 power shield. Eastern Cultural Center, Sakai city, Osaka. Image source. The Battle City CS organization has reported its latest tournament results, and the eighth Sakai ChampionShip has been won by team Priests of Double Critical. While the previous CS saw Blaukluger and Nouvelle Vague in the spotlight, this time two Omega Glendios cardfighters have taken the gold in one of the early team tournaments of the BT15-on format. One constant has remained between Battle City tournaments; as in the previous competition, the midfighter for the winning team used a dedicated Raging Form Dragon deck. 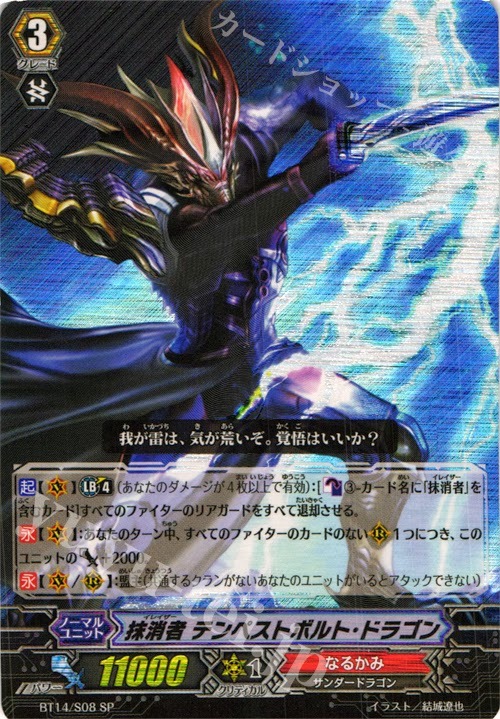 In contrast to the mix of RFD-Dragruler that have become commonplace in Japan, Adesu's RFD build has emphasized using the established Raging Form-Mordred makeup developed around BT12, foregoing the crossride entirely and mixing Blaster Dark Revenger support with cards from Infinite Rebirth. This exists in contrast to the established trend of cutting Dark Revenger entirely for Lukea and Mana, a practice that emerged in light of Dragruler's counterblast costs generally replacing Blaster Dark's. Glendios meanwhile is continuing to grow in popularity among Japanese fans after its success at the Hakata and Tsurumai VGCSes. While an innovative means of using both World Line Dragon and Dust Tail Unicorn in the same deck had been developed at Tsurumai through the grade 2 Colony Maker, this strategy has not seemed to catch on elsewhere, where additional cards of other grades are preferred for consistency over Dust Tail's additional Lock. 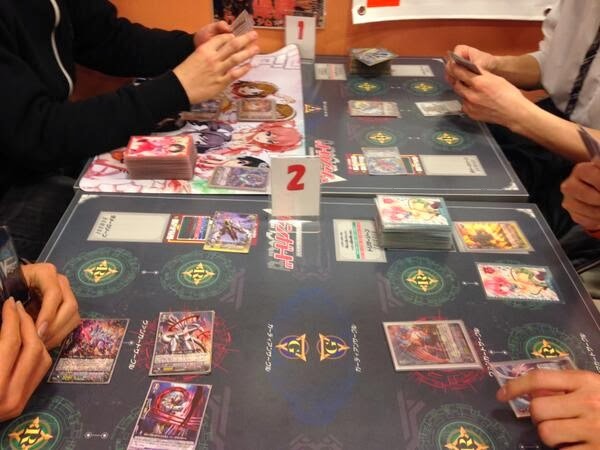 Second place team "Over There, Here and There" was made up of three Kagerou cardfighters playing Dragonic Overlord “The Яe-birth” and Nouvelle Vague decks, with the latter making up two thirds of the team. 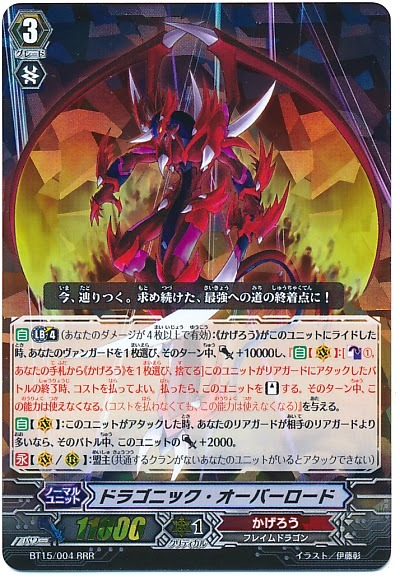 Team forward Minorun expanded Overlord's strategy slightly by experimenting with Kagerou's new grade 2 promo, Dragon Dancer Arabella, whose counterblast 1 powers up a Flame Dragon vanguard by +5000. 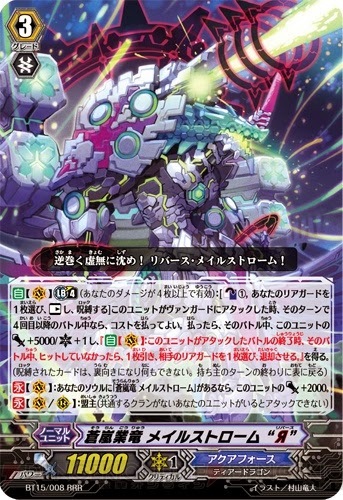 Since all of the vanguard options in the current Overlord deck make use of self-standing limit breaks, and “The Яe-birth” in particular Locks all of his own rearguards to fight alone, this build is able to make special use of Arabella by attacking with the power increase two or three times. Team OTHT's Nouvelle fighters brought identical decks that both made use of the grade 2 Dominate Drive Dragon, a base 12000 power attacker triggered by having a "Dauntless" vanguard in play. This took advantage of how long Nouvelle builds tend to sit on Dauntless Drive Dragon for their midgame before break riding to create a game-winning play of two 23000+ power attacks that can't be guarded with grade 0 units, partially answering the slow buildup Nouvelle is faced by. Interestingly, many decks in the format are now gravitating towards 6-6 on draw to critical triggers, where in the past 12 critical had dominated the deckbuilding process. The change may be attributed in part to the higher number of moving pieces in each deck these days, with Eternal Bringer Griffin, Dragonic Burnout, Dragonic Overlord and his crossbreak ride all being considered essential parts of “The Яe-birth's” strategy, and Glendios similarly looking to assemble Ruin Magician, Praseodymium and several “Яeverse” cards into a single hand. Images circulating on Twitter Japan this morning unveiled the next two extra boosters for the Japanese edition of Cardfight!! Vanguard, VG-EB11: Requiem at Dusk (宵闇の鎮魂歌 Yoiyami no Chinkonka, "Requiem of Twilight") and VG-EB12: Waltz of the Goddess (女神の円舞曲 Megami no Enbukyoku, "Goddess' Waltz.") 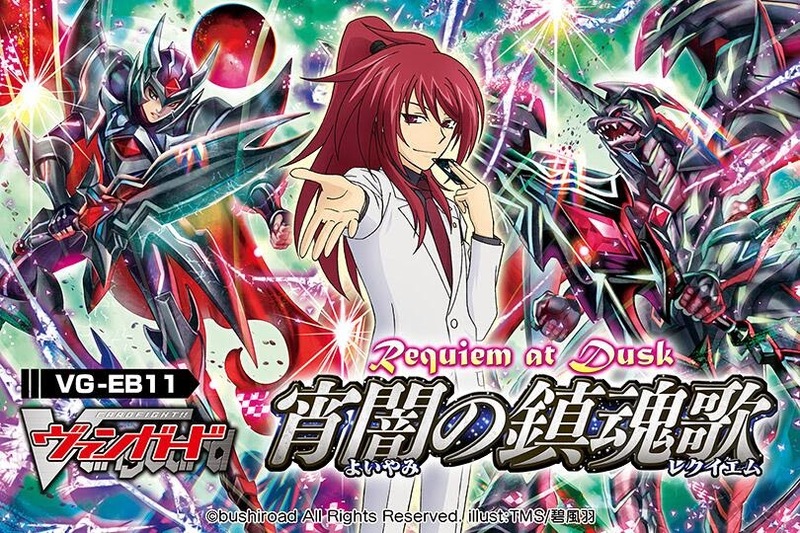 Stated to provide exclusive support for the Shadow Paladin and Genesis clans, and feature cards used by Suzugamori Ren and Tokura Misaki in the TV anime Cardfight!! Vanguard Legion Mate, the extra boosters are confirmed to support the Revenger and Regalia subclans that were introduced last year. In addition, EB11 will introduce a series of Shadow Paladin "jet-black witch" (漆黒の魔女) cards, while EB12 will introduce "snow-white witches" (純白の魔女) for Genesis. Aratana chikara, shikkoku no majo-tachi wo atsumete atarashiku Vangaado wo hajimerukoto mo dekiru! "By collecting the jet-black "Witches" you can use a new power to begin a new kind of Vanguard!" EB11 and EB12 will be released on June 20th in Japan. Each set will feature 35 cards, 25 new with 10 reprints (3 RRR, 5 RR, 8 R, and 19 C-rarity cards, with 6 Special Parallels containing only 1 reprint and 2 Legion Rares.) 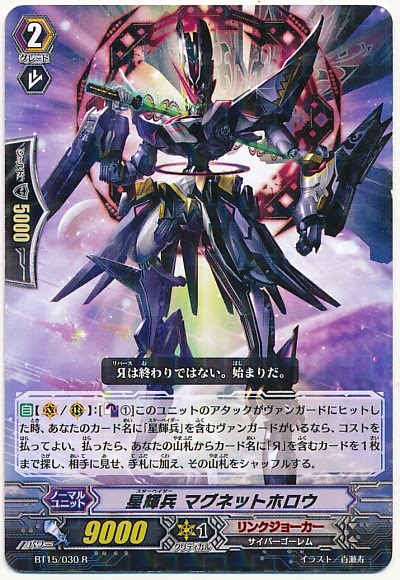 Blaster Dark Revenger is popularly believed to be one of the reprints in the set, with alternate artwork derived of the promotional image seen above, and a Legion marker to allow connectivity with the new boss card. There is also a possibility that he will be modified to be closer to Blaster Blade Seeker in skill. The sets are confirmed to include use the Legion mechanic, as was suggested at a previous press conference. This weekend brings an increased prevalence of Glendios decks with it, following on the build's initial momentum earlier this March. The second Tsurumai and eighth Battle City Vanguard Championships both concluded over the 21st and 22nd, with Link Joker fighters making a lasting impression in the top brackets of each tournament. The build's impact has varied immensely based on region, achieving greater visibility within central Japan in Gunma prefecture, than in Hokkaido to the north, where Nouvelle Vague has a better hold on the format. The second Tsurumai CS had 59 participants in all, with the top 4 going to Glendios, Dragonic Overlord, Glendios and Revenger cardfighters. This isn't the first victory for Glendios fans; the deck had been previously spotlighted in competitive play at the head of the Fireball VGCS earlier this month, under the command of tournament champion Kado. The main difference between Kado and Tsurumai winner Red Deer's decklists are that Kado was more willing to play around Omega Lock. His decklist used Cold Death Dragon where Red's uses Colony Maker, with the intent being to take the initiative away from his opponent by forcing them to put a Locked card into play, but with the caveat that he needed to be able to cast Omega Lock on that very turn to prevent the opponent from gaining card advantage in the long run. This works better with the World End alternate win condition because otherwise opponents can voluntarily choose to keep their rearguard circles open until Omega Lock fizzles to prevent the auto-win from being initiated, but Deer's decklist is geared to take advantage of how Omega slows the game down without necessarily needing to win through it. Colony Maker leads into Dust Tail Unicorn or Ruin Magician/Praseodymium depending on the conditions. Ninjin's decklist was built similarly, but with two extra Reverse cards for 14 grade 3s and just 12 and 6 grade 1s and 2s, straining the limits of established concepts of deckbuilding. 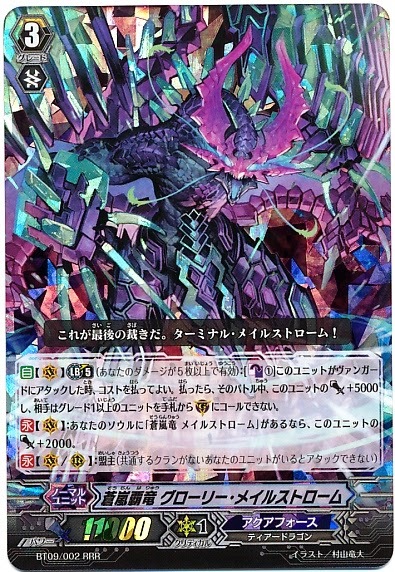 Interestingly, among those grade 3s was a copy of Dragonic Overlord “The Яe-birth.” It has frequently been assumed by westerners that “The Яe-birth” cannot be used with Glendios support because it does not have the specific phrase “Я” in its card name, but in Japan “The Яe-birth” is instead seen as being compatible because the supporting units' card text only specifies the backward R character, Я, in card names, and because the phonetic reading for Яe-birth and Яeverse are the same リバース Ribaasu. It's uncertain how the English-language incarnation of the card will handle the intentional double meaning behind “The Яe-birth,” as there are no standards in English for phonetic guides. Second place cardfighter Sousuke reached the top bracket using a Dragonic Overlord the “The Яe-birth” deck, with notable similarities to the makeup of Beast Deity Cup champion Hisui's deck. Both cardfighters agreed for the most part on the grade 2 and 3 makeup of their builds, with Dragonic Burnout and Berserk Dragon being favored units for their on-call field control that makes use of the rearguard circles Яe-birth Locks, but Hisui prioritized accessing the break ride with Eternal Bringer Griffon more where Sousuke went for raw draw power using Calamity Tower Wyvern and Gojo's card changing to ditch excess draw triggers. Meanwhile the eighth Battle City Trio CS concluded recently with first place going to a Glendios, Dragruler and Glendios team while second went to three Kagerou cardfighters running two Nouvelle Vague and one Overlord decks. Third place was a makeup of Glendios, Blue Storm and Kagerou; deck lists are not yet available, but the Blue Storm build is suspected to be a Maelstrom build along the same lines as the one that recently placed second in the first Sapporo VGCS. The success of a triple Kagerou team points to the mutual effectiveness of separate but contemporary Kagerou decks, even in spite of Nouvelle being generally regarded as king among them. With Dauntless Dominate Dragon “Я” likewise hanging around in tournament results, many are eyeing Kagerou as a mainstay clan for the 2014 tournament season on both sides of the water. The next eight English-language set releases have been announced through the official Cardfight!! Vanguard USA Facebook page, and much excitement has been raised over the upcoming release of VGE-FC: Fighter's Collection 2014 at the end of the year. Due to the nature of FC sets as primarily featuring reprints with few new cards and the rapid release schedule of the game's English edition, it has been a concern of the English-language Cardfight community that they would never get a western release. FC2014, which is set to feature at least 23 new cards with one new grade 3 for each of the clans, has more incentive to be brought over to western shores due to the decreased count of reprints. All of these sets have been added to the official products page, sans set images. With 37 cards and just 7 known reprints, FC2014 will feature SP reprints of Majesty Lord Blaster, Goddess of the Full Moon Tsukuyomi, Phantom Blaster Overlord, Dragonic Overlord the End, Eradicator Vowing Sword Dragon, Perfect Raizer and Top Idol Pacifica. The full Japanese setlist is not yet currently known, but as no English release of FC2013 has been announced and the set size of Fighter's Collection sets is not necessarily set in stone, it has been variously speculated that the English release could include cards from FC2013 by bumping the set size up to a full 72~80 cards, similar to the set sizes of BT01~BT05. The lack of a release for FC2013 has been a sore spot for westerners, in part due to the exclusive break rides Bleoberis and Electric Shaper Dragon, and also due to the highly coveted alternate artworks in the set for Asura Kaiser, Phantom Blaster Dragon, Blaster Blade and Blaster Dark. More immediately, VG-BT14: Brilliant Strike and its accompanying pool of Reverse cards are suspected to be arriving in July or August. Eight releases are scheduled for after June, and with only six months remaining in that time period, it's possible that some of these will be dual releases within a single month. In particular, TD13: Successors of the Sacred Regalia and the later trial decks TD14: Seeker of Hope and TD15: Brawler of Friendship are all opportune products to release in the same month as accompanying booster sets due to how they complement the cards in Brilliant Strike and Legion of Dragons and Blades. Another possibility is for the sets following Infinite Rebirth to be released in the winter months following the new year, though this would contradict Fighter's Collection 2014's placement. With these factors in mind, the annual World Championships--which have historically taken place in August/September through December/January--will likely be held in at least a Brilliant Strike or Divas Duet-on format, with Infinite Rebirth available in time for the finals. This oncoming rapid release schedule will likely put the English card game close to being totally synchronized with the Japanese TCG, matching the goal outlined at last year's Anime Expo of achieving simultaneous release. Decklists from the first Sapporo VGCS went up late yesterday evening, along with accompanying videos of the final match. Although the tournament marks yet another top spot for Kagerou cardfighters, interest in the second place fighter's Aqua Force deck has exceeded that in the Nouvelle fighter's, both in Japan and internationally. Second place cardfighter Mantesu created an innovative Maelstrom “Яeverse” deck modeled on the Glory Maelstrom builds of old, with nine grade 3s including familiar Diamantes support to pull off the deck's various limit breaks. There is a substantial division in how “Я” Maelstorm is being played however. 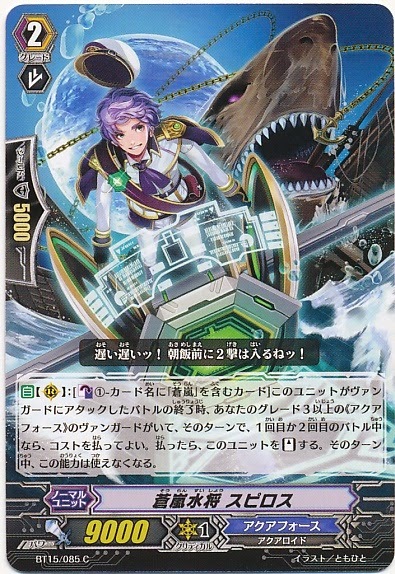 Unlike past and current Aqua Force fighters that tend to tech Glory Maelstrom at one copy, Mantesu's post-BT15 Maelstrom deck focused very heavily on the new crossride, running it at 4/3 with its original form. The first Sapporo VGCS reportedly drew 60 persons including spectators, with 48 persons participating in the championship; Mantesu was the only Aqua Force cardfighter present. His version of the deck made use of a combination of Blue Storm and Brave Shooter support. 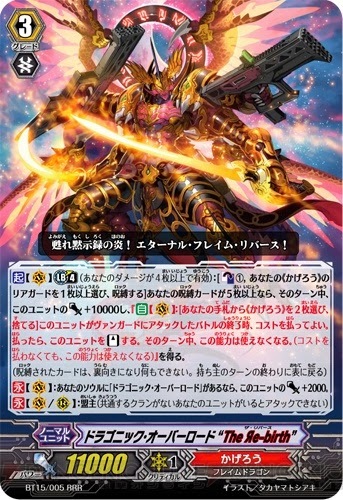 The first vanguard Marios can search the top 5 cards of the deck for a Maelstrom unit to put into hand when an attack that it boosted hits a vanguard, potentially giving two to three opportunities to search for one of Mantesu's seven Maelstrom grade 3s before he needs to ride one. However, in both of his games with Nouvelle cardfighter Kukkii, Marios was shut down on his opponent's second turn by Gattling Claw Dragon. With Hermes and the grade 1 Brave Shooter, Mantesu had six options for base 10000 power attackers as early as turn 1, and Storm Rider Eugen let him take advantage of that further by attacking for an 8000 power base early on, then swap out for either Brave Shooter or Hermes for a second attack. Blue Storm Marine General, Spyros. Including the vanguard, that can create an early three attack combo. This is where the deck's eight stand triggers come in, as they exacerbate the opponent's initial dilemma of facing repeated and early attacks when guard power is typically low. Tidal Assault is meant to facilitate that further at turn 2; a base 9000 power unit that stands itself after attacking and loses -5000 power in the process, Assault is intended to attack unboosted first and then with a boost second so that it swings in the ballpark of an 11000 base for the second blow, just enough to graze most grade 3s in the format. From turn 3 onward it can also enable multiple-attack vanguards alongside the counterblast-to-stand Spyros and the Blue Storm base 12000 attacker Gregorious, who works well when swapping positions with Diamantes. This enables both Maelstrom “Яeverse” and Maelstrom's +5000 power limit breaks, which activate during the fourth or greater battle of the turn. If Maelstrom's attack hits it can counterblast 1 to retire one of the opponent's rearguards and draw a card, grabbing up a net advantage of 2 by giving the opponent a -1 and his own cardfighter a +1, which together with the multiple attacks and stand triggers snowballs into the opponent having very few cards in play regardless of how they approach the attacks. Even if Maelstrom is defended, attacking for a ~23000 power base is a tall order to defend early with or without a perfect defense card, and potentially denies the opponent their limit break while Mantesu is setting up his crossride. The major fault of the deck is when it does not draw the cards necessary to pull off its strategy, as in the first game of the Sapporo finals where Mantesu went second but had none of his early game offensive power, and late in the second game where he had his Reverse card in play but not a strong enough field to trigger the limit break. Damage triggers can also upset this strategy at any point in the fight, as they effectively decrease the entire field's power by 5000. But with so many options for triggering the fourth attack condition, the consistency of the build is still sufficient to stand up to professional giants like Nouvelle Vague and Raging Form-Dragruler. Meanwhile the decklists from the Beast Deity Cup are out, and much excitement has been raised over the success of Dragonic Overlord “The Яe-birth.” While generally agreed on as a strong contender in the current format, “The Яe-birth” has also been overshadowed by its grade 4 big brother, Nouvelle. Яe-birth's Lock field skill prevents anything but the vanguard from being used for the turn, but gives its vanguard +10000 power and a skill that allows it to stand by discarding two cards after an attack. In conjunction with the skill of the BT15 break ride that Яe-birth is a crossride of, this allows for up to three attacks and six drive checks with no loss in card advantage, equivalent in practical terms to giving the entire field twin drive for one turn. 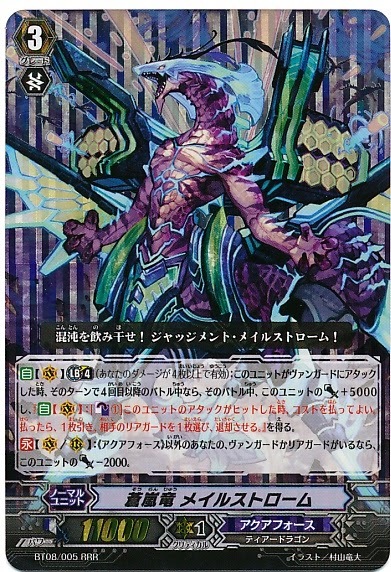 Generally Яe-birth has been used in conjunction with on-call skills like those of Calamity Tower Wyvern and Berserk Dragon, but has only penetrated tournament play in small numbers. Hisui's victory with it is one early footholds in the BT15-on format. The latest BeNeLux tournament concluded on March 9th early this week, with reigning world champion Almeida Stewart taking first place using an Aqua Force deck atypical of the BT12-on format. The BeNeLux tournaments are a line of unofficial competitions organized by the joint vanguard community of Belgium, the Netherlands and Luxembourg. Although open to being held in any of the three countries' major cities, it is typically held in Antwerp, Belgium on a monthly to bimonthly basis; due to its relatively high turnout in the range of ~30 persons minimum, it has been nicknamed the VGCS of BeNeLux. Stewart's decklist emphasized better than average draw power, speed and consistency. The core of it used the Ripple evolution cards for ride security to search out Pavroth or Genovius, with the grade 1 and 2 Brave Shooter support for base 10000 and 12000 attackers that allowed better early aggression. This also worked well with Pavroth's ability to stand and power up a rearguard in the midgame, turning Twin Strike Brave Shooter into a base 15000 attacker on the second strike. Stewart ran three copies of Penguin Soldier for its soulblast-and-draw skill, reasoning that with the deck's break ride he would always have four cards in the soul to use two of the Penguins later on. 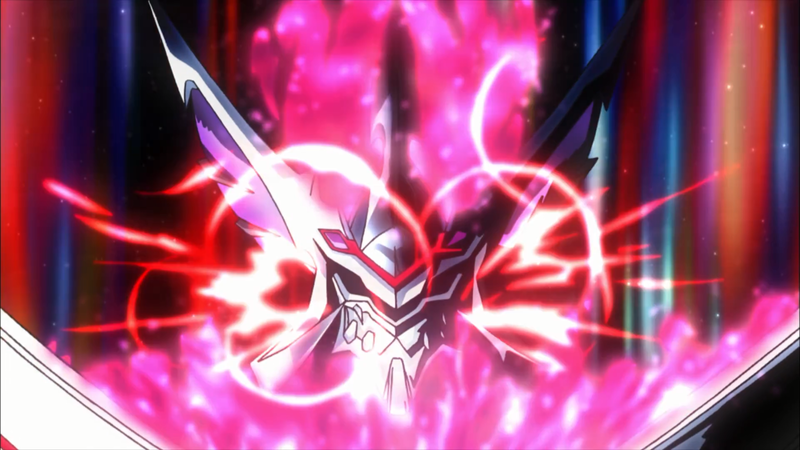 His main strategy was to break ride Genovius over Transcore Dragon; attacking with both rearguard lanes first would bring the opponent to 5 damage, Transcore's skill would force the opponent to discard a card just to be able to guard in the first place to ensure a -3 even if they had a perfect defense card, and Genovius' persona blast would stand both rearguard columns to ensure that he would have two more attacks waiting to receive any trigger checks. Meanwhile more details on the upcoming sequel to the Nintendo 3DS game Ride to Victory, Cardfight!! Vanguard Lock on Victory, have just come out through an Amazon listing. Announced last December, the sequel will feature over 2300 cards, support both local and internet play, and allow the sending of messages to other players after concluding a cardfight. Lock on Victory will also come packaged with four copies of Setting Sun Star-vader Darmstadtium, each foiled as an R-rarity card. Retailing for 5229 JPY (approx. 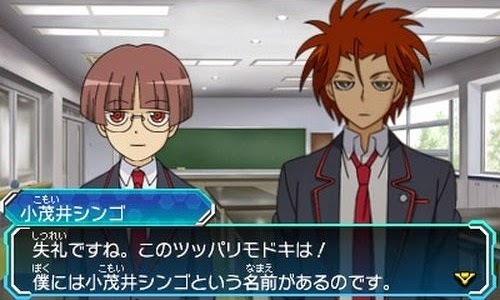 52 USD) the game is scheduled for a June 5th release in Japan, will introduce four new protagonists and will allow the player to attend a high school of their choice from the anime series, between Kai Toshiki's Hitsue High, Sendou Aichi's Miyaji Academy, and Suzugamori Ren's Fukuhara High School. 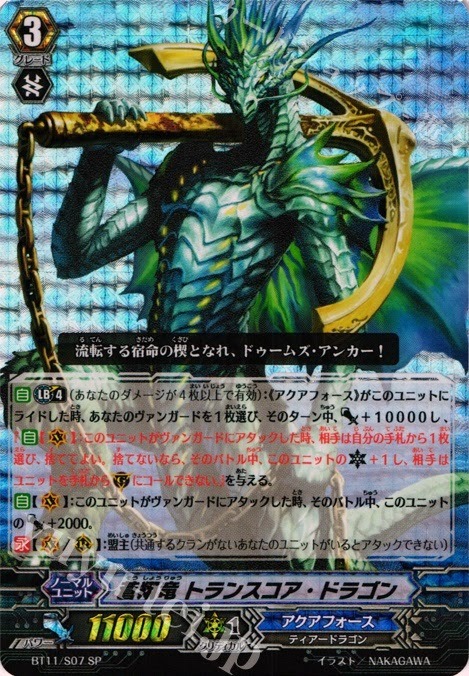 Recent issues of Monthly Bushiroad magazine have also shown Reversed cardfighters appearing, with Naoki and Koutei making use of their Vowing Saber Dragon and “Я” Daiyusha decks respectively. 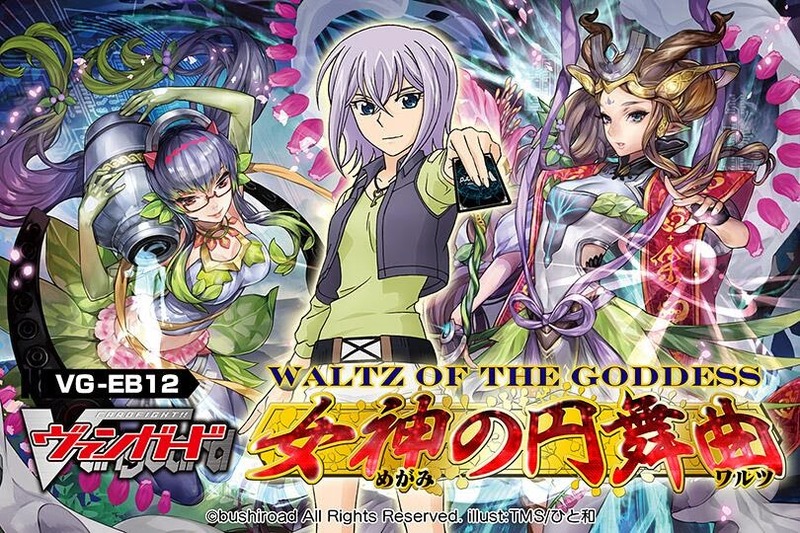 Although past campaigns to bring the first game over have not succeeded, Bushiroad was responsive to fans' initial requests for FuRyu's game to be translated for the western markets, to the point that internal talks had begun by the time of Anime Expo 2013. As Ride to Victory was never designed with an international release date in mind, there may yet be hope for its sequel. Los Angeles, CA (March 13, 2014) – Due to popular demand, Bushiroad is adding a 7th qualifier to its North American Team League 2014 tournament series. The Sam Houston Ballroom and Conference Center in Houston, Texas will be host to the Cardfight!! Vanguard Team League qualifier on May 31, 2014. 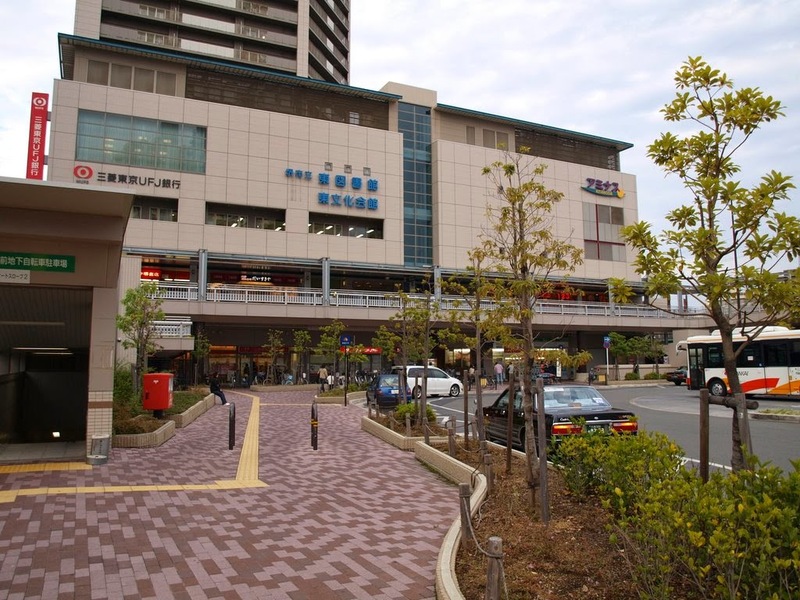 The same venue will play host to the Weiβ Schwarz Neo-Showdown and Future Card Buddyfight Buddy Challenge the following day on June 1, 2014. In total, there are now five qualifiers spread throughout the United States in New York, Georgia, Texas, Ohio, and Los Angeles, and one qualifier each in Mexico and Canada. The championship for all three tournaments will take place at Anime Expo 2014 in Los Angeles, California on July 5, 2014. The third Laketown Vanguard Championship decklists went up on Card Shop Fireball's official blog early yesterday morning, showcasing some of the first competitive decks of the Infinite Rebirth-on format. Tournament winner Kado's “Ω” Glendios deck is of particular interest in part because it's the first Glendios deck seen in tournament play, and also due to its unusual composition, running a huge count of twelve grade 3s and just seven grade 2s. 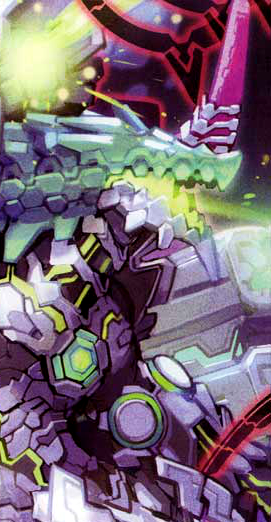 Previously only Aqua Force, Dimension Police and Nova Grappler cardfighters tended to run grade 3 heavy decks on a regular basis, due to their variety of grade 3 options and necessity for two or more gameplans in one deck, but Glendios is a different beast entirety. Some concern over the validity of the results has been expressed due to this Fireball CS only seeing a turnout of 34 persons when 60~80 is more common in VGCS events, but now that the decklist is visible it's clear that a thorough amount of work was put into its construction. The high grade 3 count was generally anticipated by experienced Link Joker cardfighters due to the overall strategy of the build. 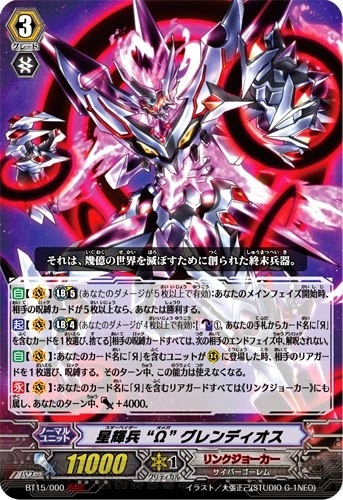 “Ω” Glendios decks as a rule now rely on either Omega himself or Star-vader “Яeverse” Cradle Cradle; both of these boss cards use Link Joker's signature Lock mechanic by calling cards with “Яeverse” in their name to rearguard circles, and accordingly can make any “Яeverse” into a Link Joker unit to promote synergy. In order to use their skills effectively, a high grade 3 count is necessary. Kado also exploited this to his advantage by running six different “Яeverse” cards, five of them as single copies, in order to obscure exactly how many he was running from his opponents. 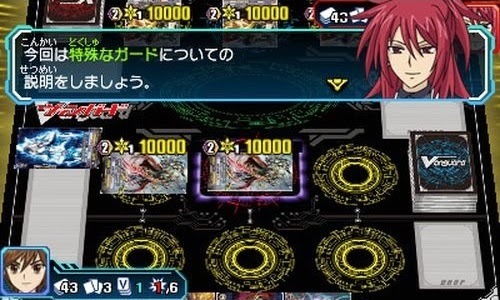 The core Omega strategy hinges on using Glendios in tandem with Ruin Magician, Praseodymium, Rubidium, Magnet Hollow, any two Reverse cards and the first vanguard World Line Dragon. Prior to hitting grade 3, Glendios' early game primarily revolves around trading Reverse cards in hand at the beginning of each ride phase with World Line's skill to search for other Link Joker units, avoiding the problems associated with failing to reach grade 2, and ideally replacing the Reverse cards discarded with other Reverse cards, primarily Cradle. Magnet Hollow is the build's most valuable grade 2 because of how it instantly adds a Reverse card to hand for a single counterblast when its attack hits, which lets Glendios or Cradle Lock one card per turn, and Glendios can then use its limit break to cast Omega Lock and prevent the opponents' cards from unlocking for one turn. Omega can then get those Reverse cards back by calling Ruin Magician, who for counterblast 1 returns a Reverse card from the drop zone to the hand for each other Reverse on a rearguard circle, and unflip the damage with Praseodymium who operates on the same principle as Ruin. 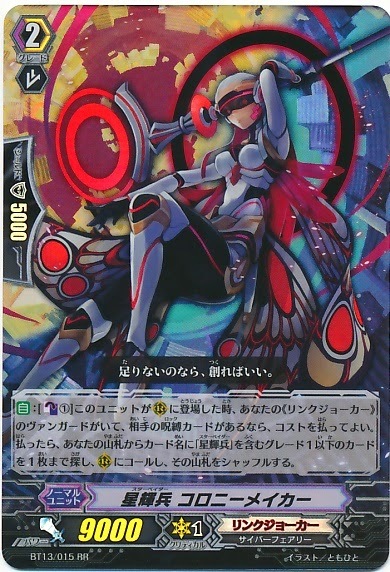 Rubidium is a special card that changes the target of the opponent's attack a rearguards with Reverse in its name, which compensates for the lower overall shield of a grade 3-heavy deck, and prevents skills that only activate when attacking a vanguard from going off. Although these tactics were conceived with the idea in mind of using Omega Glendios' ultimate break skill to achieve an alternate win condition--automatically winning at the beginning of the main phase if the opponent has 5 or more Locked cards in play--the real outcome of fights with Omega have varied immensely. Being restricted to Locking a single card each turn (and only able to potentially subvert that with the occasional Cold Death Dragon who gives the opponent a card from their deck in the Locked position) achieving World End is frequently an unrealistic goal. Instead Glendios' main strategy has been to stall the opponent out by being able to Lock both frontrow rearguards with relative ease and cast Omega Lock while recycling the discarded cards, immensely slowing down games until they take double the amount of turns to complete. Since Omega powers up all Reverses to have a 15000 power base, the opponent is denied the ability to use their rearguards while Omega's strike for higher numbers on average. Meanwhile word has gotten out that Kagerou is likewise dominating the first Sapporo VGCS over on the opposite end of the archipelago. 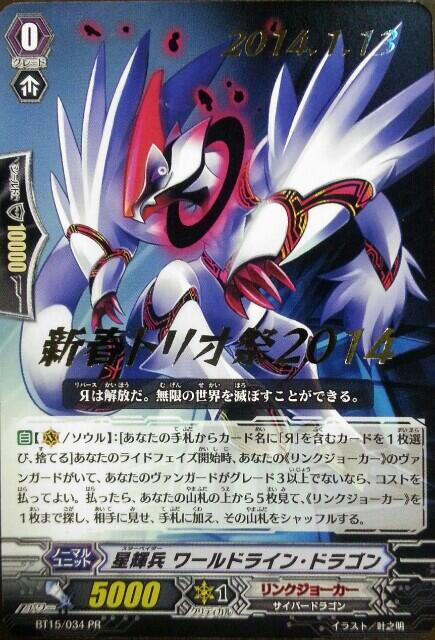 Sapporo's top 8 was made up of three Kagerou, three Link Joker, one Shadow Paladin and one Aqua Force cardfighters. As this is the first major headway for Aqua Force in the wake of BT15, many observers are eager to see where professional cardfighters have developed the clan in the first two weeks of the new format. 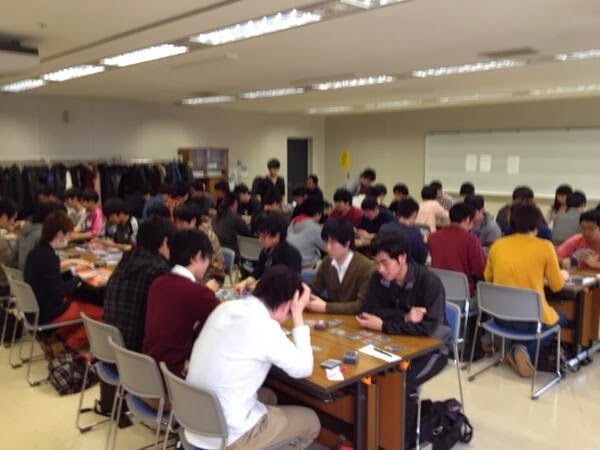 Four different VGCS tournaments took place over the weekend; the third Laketown VGCS held by card shop Fireball, the Juushinhai "Beast Deity Cup" tournament held at Minami-Koshigaya in Saitama, the Kitakyuu CS, and the Half Moon CS at Honchouku hall in Shibuya. The decklists from Fireball and Juushinhai are still pending, but the results of the tournaments are already known without them. The Fireball CS is getting attention for being the first publicized victory for Star-vader "Ω" Glendios, run by Link Joker cardfighter Kado. Turnout was relatively low, with just 34 persons attending due to poor weather, and twelve among them playing Kagerou decks, but Kado's success with Omega is still being treated cautiously as what may be the first of many shots fired. Over at the Kitakyuu CS first place went to Botan using Dragonic Nouvelle Vague, while second place was taken by Sutepo! 's [sic] Tempest Bolt Dragon. Nouvelle is a familiar face in professional play for his widespread success in fan tournaments and for putting Conroe on the restricted list, and Botan has not strayed far from established conventions. 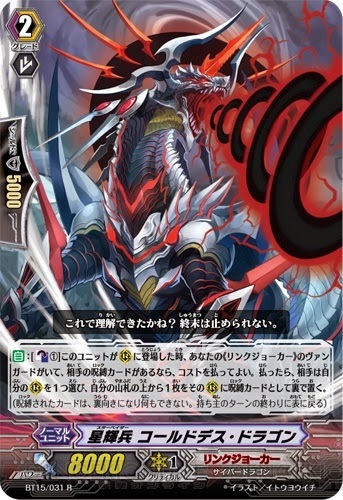 The one experimental point in his deck is the use of the BT15 break ride print of Dragonic Overlord in combination with Dauntless Drive Dragon, giving him multiple options for a self-standing break ride skill prior to going into Nouvelle Vague for his endgame, and the ability to break ride multiple times with different types of skills coming out of that. Vague by himself already attacks with a high base power, negates the opponent's damage triggers and can't be defended with grade 0 units, so attacking twice typically takes out around 6~8 cards in a single turn. The card is scheduled to hit American shores in June. Tempest Bolt meanwhile has been a very rarely seen competitor in the BT14-on format, but has been praised for the innovations that he's brought to the game. 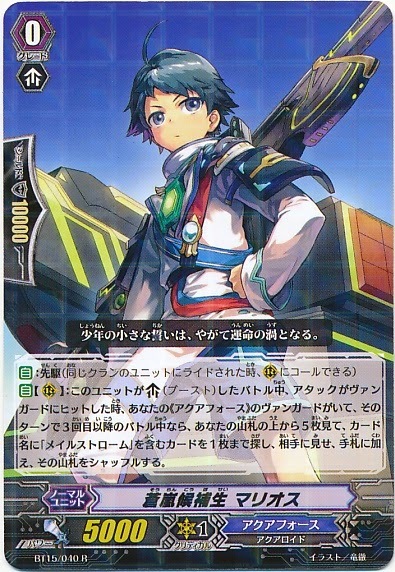 A base 11000 Narukami grade 3, his continuous skill gives him +2000 power for each unoccupied rearguard circle during his fighter's turn, so that any field commitment on her part decreases Tempest's final power even though it improves field position, while withholding cards from play can become advantageous for how it improves the vanguard's independent attack. Lastly, in the Half Moon team CS on March 1st, a team comprised entirely of Shadow Paladin Revenger cardfighters won the tournament, with second place going to a team comprised of Aqua Force, Holy Shine Dragon, Dragonic Overlord, Monarch Sanctuary and Dauntless Dominate fighters. The championship used a somewhat unorthodox model, with no clan restrictions, and 32 teams of five cardfighters competing in a format where a team would win as soon as three of its members had won their games. The tournament began with four rounds of Swiss draw followed by a cut to the top 8 teams. Entry was 5000 yen per team (1000 yen per person or $50 total) with first place getting five Nintendo 3DS systems, second place getting ten boxes of VG-BT15: Infinite Rebirth and third place five boxes. The total prize pool was thus around 160,000 yen or $1500. Although the composition of every team member's deck is not known, one member "Ekusu" photographed his list to the net, showing a combination of Phantom cards and Raging Form Dragon with the popular Sword Breaker from BT15 to work in conjunction with the Phantom support. The decklist is provided below under the heading [HMVGCS]. In other news, the Sneak Preview tournament for VGE-EB07: Mystical Magus is coming up next month on April 4, 5 and 6, and will feature Pentagonal Magus as the participation prize for taking part in the tournament. 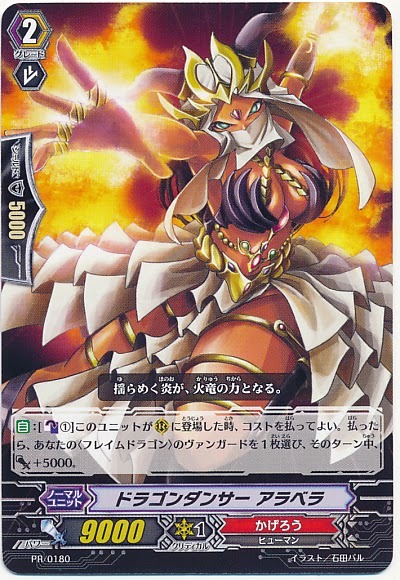 Pentagonal was originally distributed with volume 6 of the manga in Japan, and is generally accepted as the most suitable partner unit to the deck's break ride Hexagonal Magus, as her limit break effectively gives her an extra critical trigger by granting her +5000 power and +1 critical if her cardfighter can successfully guess the top card of the deck when she attacks, and Hexagonal's break ride skill allows them to look at and rearrange the top two cards before then. 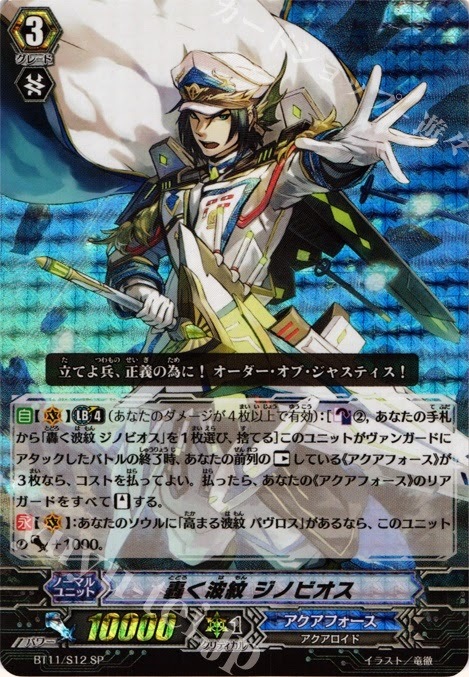 Fittingly, the mat for the seventh extra booster will feature Hexagonal Magus, with artwork provided by Itou Akira.